Wyndham Collection WCVJ23136SCHIBUNOM24 - 36" Single Bathroom Vanity in Cherry, Imperial Brown Granite Countertop, Undermount Oval Sink, & 24" Mirror. ACF by Nameeks ACF LOR01-LC Loren 33-in. Single Bathroom Vanity Set. Modern wall-mounted vanity set. Engineered wood cabinet with metal pulls. Larch Canapa finish with polished chromed accents. 2 soft-close cabinet doors. Choice of Faucet drill holes. Rectangular white ceramic sink bowl. Includes wall-mounted vanity, fitted white ceramic sink, and mirror. Faucet not included. Perfectly pairing style and function, the ACF by Nameeks ACF LOR01-LC Loren 33-in. 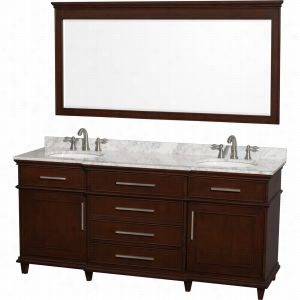 Single Bathroom Vanity Set - Larch Canapa is just the way to overhaul your bathroom. 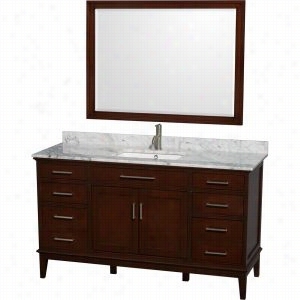 This three-piece set includes a vanity, fitted white ceramic sink, and mirror; it just needs your choice of faucet. The play of the chrome hardware and Larch Canapa finish of the vanity is sure to catch your eye. Mounting securely to your wall, the vanity has a unique floating effect.Component Dimensions:Vanity dimensions: 32.7W x 17.5D x 21.8H in.Mirror dimensions: 28.3W x 33.5H in.Fitted rectangular sink dimensions: 23.6W x 17.7D in.About NameeksFounded with the simple belief that the bath is the defining room of a household, Nameeks strives to design a bath that shines with unique and creative qualities. Distributing only the finest European bathroom fixtures, Nameeks is a leading designer, developer, and marketer of innovative home products. In cooperation with top European manufacturers, their choice of designs has become extremely diversified. Their experience in the plumbing industry spans 30 years, and is now distributing their products throughout the world today. Dedicated to providing new trends and innovative bathroom products they offer their customers with long-term value in every product they purchase. In search of excellence, Nameeks will always be interested in two things: the quality of each product and the service provided to each customer. Wyndham Collection WCS211172DESIVUNSM24 - 72" Double Bathroom Vanity, Ivory Marble Countertop, Undermount Square sinks, & 24" Mirrors. Wyndham Collection WCS211172DESIVUNSM70 - 72" Double Bathroom Vanity, Ivory Marble Countertop, Undermount Square sinks, & 70" Mirror. Wyndham Collection WCS141460SGYCMUNOM58 - 60" Single Bathroom Vanity, White Carrera Marble Countertop, Undermount Oval Sink, & 58" Mirror. 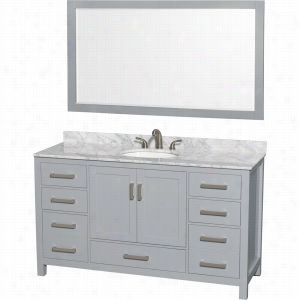 Wyndham Collection WCV161660SCDCMUNSM44 - 60" Single Bathroom Vanity, White Carrera Marble Countertop, Undermount Square Sink, & 44" Mirror. Avanity MODERO-VS60-CG Modero 60-in. Double Bathroom Vanity Marble Beige Top. 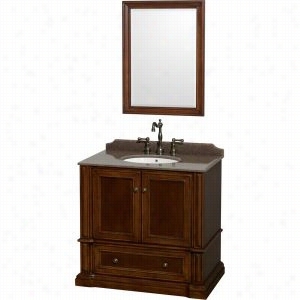 Overall Dimensions: 61W x 22D x 35H in.. Large, free-standing classical double vanity. Made from engineered wood and hardwood solids. Dual rectangular undermount sinks included. Choose from several top options; faucets not included. Surface is fitted for two 3-hole faucet assemblies. The Avanity MODERO-VS60-CG Modero 60 in. 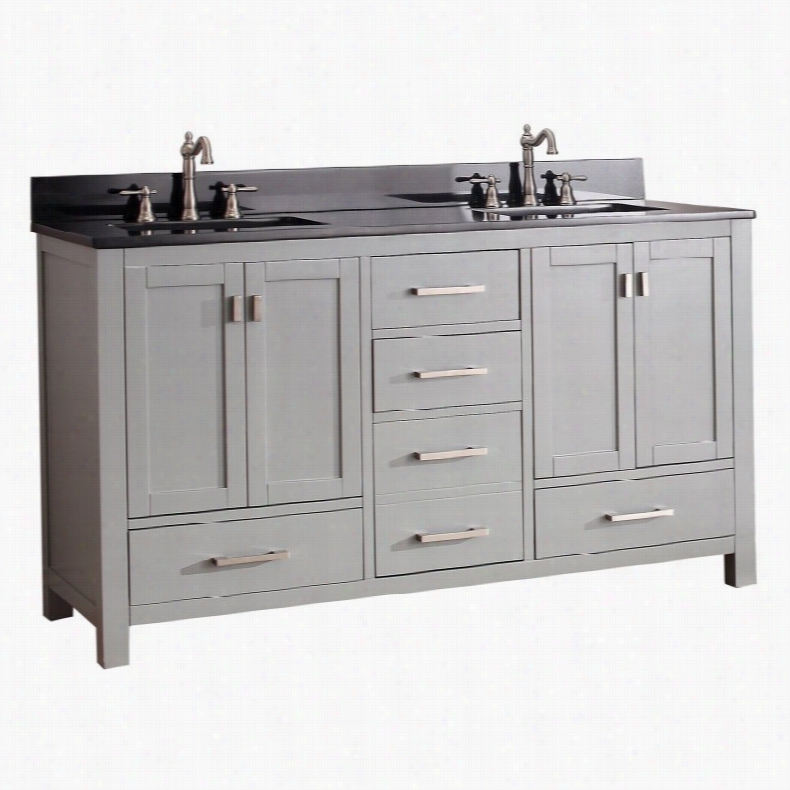 Double Bathroom Vanity &ndash; Gray is a must-have addition to make your master bathroom the ultimate in both beauty and versatility. You'll never hunt for storage space again thanks to the five soft-closing drawers and two double-door cabinets built into the base. Each of the drawers and cabinets is outfitted with solid metal hardware (finished in brushed nickel). The frame itself is constructed from solid poplar hardwoods and medium-density fiberboard. A handsome chilled gray finish brings the look to a close. Choose your preferred style of stone top, each with a matching backsplash, or choose no top at all. Two rectangular undermount vitreous chine sink basins are included; the surface is pre-drilled to allow for installation of two widespread 8-inch faucet assemblies; faucets not included.About Avanity CorporationAvanity's goal has always been to provide the public with the best Products possible at the fairest prices. To this end, their customer service style is about listening to their customer, not just hearing them. Avanity is confident in all of their products and provides a one-year manufacturer's warranty to prove it. Avanity also takes note of increasing market trends to stay ahead of the game and provide the most cutting-edge products available. Color: Marble Beige Top. Wyndham Collection WCV171772DCDCMUNRM70 - 72" Double Bathroom Vanity in with White Carrera Marble Top with White Undermount Oval Sinks & 70" Mirror. Avanity HAMILTON-VS42-FW Hamilton 42-in. Single Bathroom Vanity Marble Beige Top. 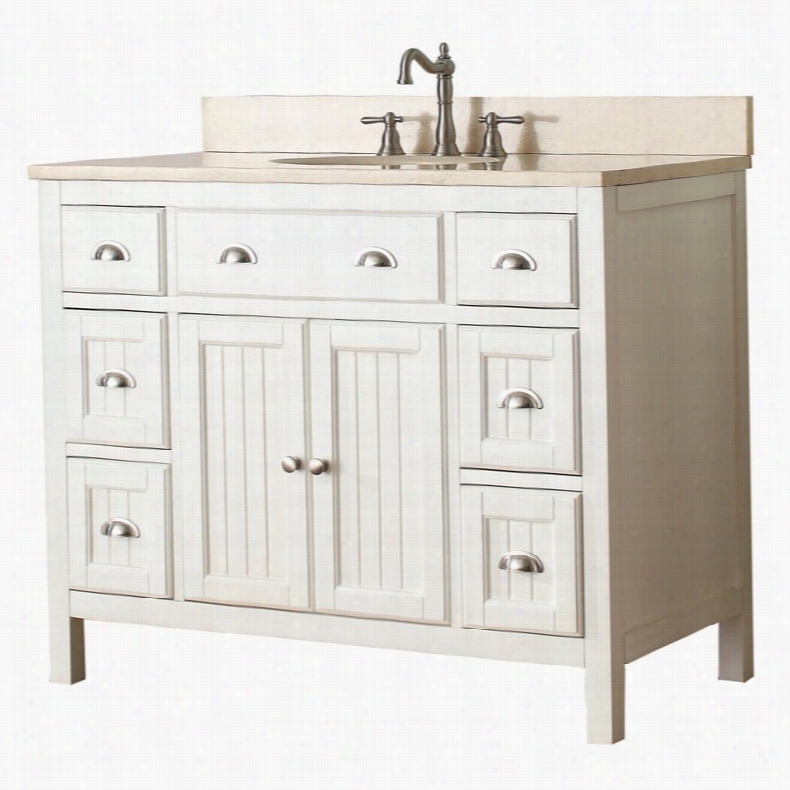 Overall Dimensions: 43W x 22D x 35H in.. Beautiful bathroom vanity with a classical look. Solid hardwood frame with engineered wood support. An undermount oval sink is available. Choose from several top options; faucets not included. Top is drilled for a widespread faucet assembly. The Avanity HAMILTON-V Hamilton 42 in. Single Bathroom Vanity - French White makes a handsome focal point to your master bathroom design scheme. Its wide, freestanding frame is made from solid poplar hardwoods and medium-density fiberboard featuring a French white finish. A double-door Cabinet sits at the center of the frame, featuring an adjustable shelf that's perfect for storing extra towels. Six soft-close drawers are also built into the design for keeping toiletries and other supplies. The vanity come alone or capped by a solid stone top, pre-drilled for an 8-inch widespread faucet assembly (faucet not included) and paired with a matching backsplash; stone top options subject to availability. An oval undermount sink made from fine vitreous china is available; vanity cabinet is also available without a sink.About Avanity CorporationAvanity's goal has always been to provide the public with the best products possible at the fairest prices. To this end, their customer service style is about listening to their customer, not just hearing them. Avanity is confident in all of their products and provides a one-year manufacturer's warranty to prove it. Avanity also takes note of increasing market trends to stay ahead of the game and provide the most cutting-edge products available. Color: Marble Beige Top. ACF by Nameeks ACF DA02-SO Dadila 33-in. Single Bathroom Vanity Set. Modern wall-mounted vanity set. Engineered wood cabinet with metal pulls. Style Oak finish with polished chromed accents. 2 spacious drawers. Choice of faucet drill holes. Rectangular white ceramic sink bowl. Includes wall-mounted vanity, fitted white ceramic sink, and mirror. Faucet not included. Enjoy the sophisticated use and style of the ACF by Nameeks ACF DA02-SO Dadila 33-in. 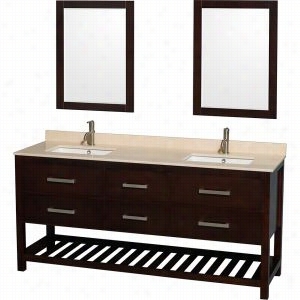 Single Bathroom Vanity Set - Style Oak, which puts all your bath needs right in reach. Complete with vanity, fitted white ceramic sink, and mirror, this three-piece set just needs your choice of faucet. 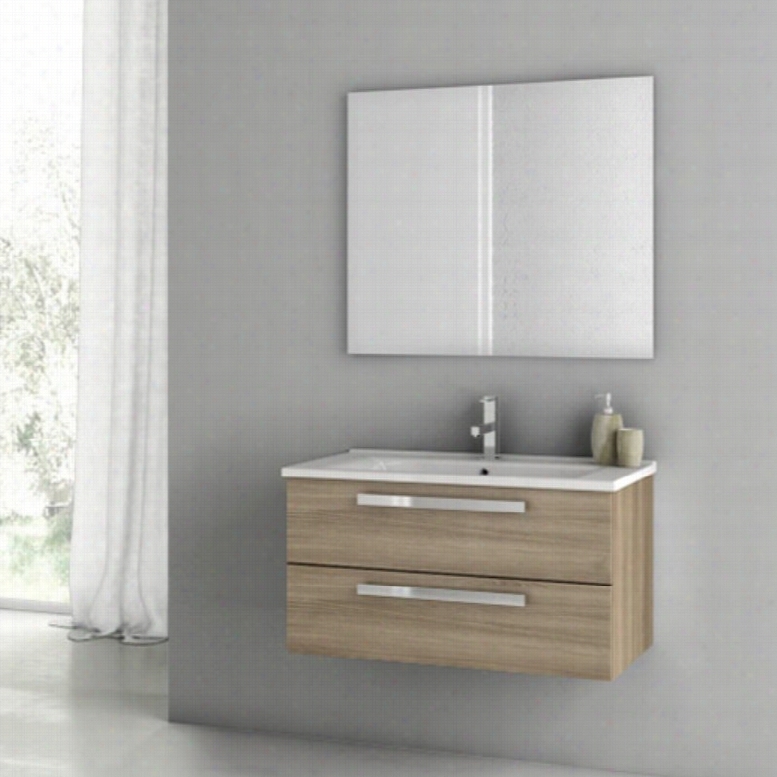 Mounting securely to your wall, the vanity has a unique floating effect. 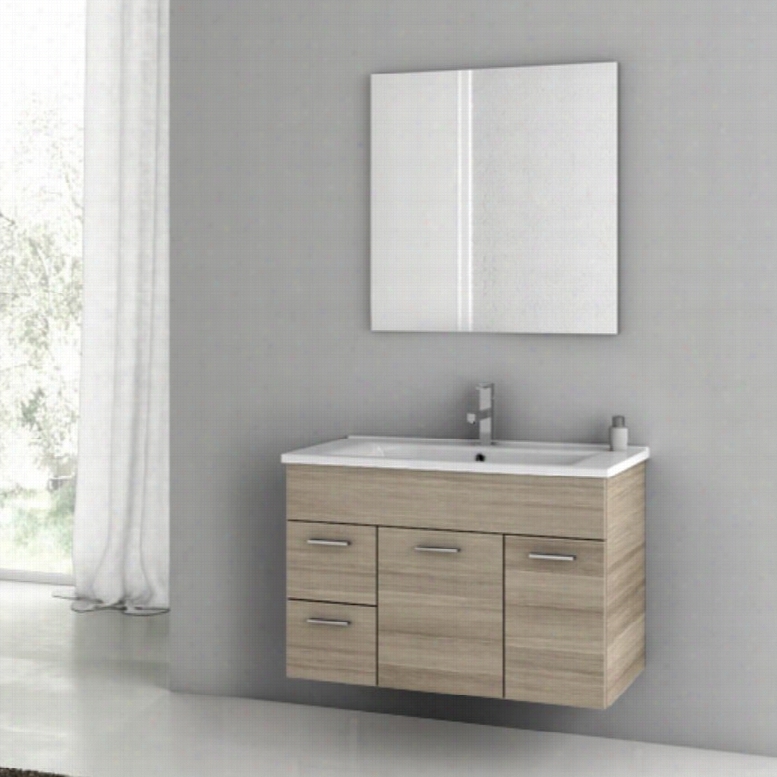 The play of the chrome hardware and style oak finish of the vanity is sure to catch your eye.Component Dimensions:Vanity dimensions: 32.7W x 16.9D x 17.5H in.Mirror dimensions: 28.3W x 33.6H in.Fitted rectangular sink dimensions: 23.6W x 17.7D in.About NameeksFounded with the simple belief that the bath is the defining room of a household, Nameeks strives to design a bath that shines with unique and creative qualities. Distributing only the finest European bathroom fixtures, Nameeks is a leading designer, developer, and marketer of innovative home products. In cooperation with top European manufacturers, their choice of designs has become extremely diversified. Their experience in the plumbing industry spans 30 years, and is now distributing their products throughout the world today. Dedicated to providing new trends and innovative bathroom products they offer their customers with long-term value in every product they purchase. In search of excellence, Nameeks will always be interested in two things: the quality of each product and the service provided to each customer.